Lemongrass essential oil (Cymbopagon flexuosus) is created by steam distilling the leaves/blades from this grass. o Lemongrass is said to be the oil of energetic cleansing. - Helpful in clearing energy from a home, or letting go of negative energy you might be holding onto, which may help those feeling stuck, heavy, or depressed. o Lemongrass blends well with a variety of other essential oils from florals to herbals: lavender, geranium, rosewood; blends well with other top note citrus oils such as sweet orange, lime or bergamot. For an exotic twist, blend lemongrass with vanilla oil or fragrance, or sandalwood. o Lemongrass is a fast growing, tall, aromatic perennial grass that grows up to 1.5 meters in height. It is native to Asia, but is now cultivated mostly in the West Indies, Africa, and Tropical Asia. 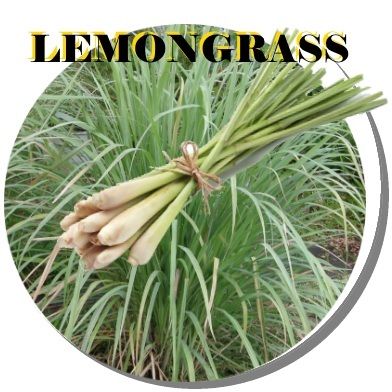 o Lemongrass may help improve circulation, eyesight, combat headaches, infections, respiratory problems, sore throats and fluid retention and aids in tissue regeneration. o Aromatherapists value lemongrass for its ability to both calm and revitalize, to relieve tension, invigorate, and inspire. The tall tropical grass fills this tall order beautifully. A calming note in aromatherapy, lemongrass oil works well to relieve stress. Mix several drops with jojoba oil to create a soothing massage oil that alleviates muscular aches and pains.Use lemongrass essential oil in hair care formulations -- it will add shine and lustre to dull hair. In perfuming, lemongrass is considered a top note. Use sparingly - lemongrass can sensitize the skin.